English muffins are a small, round, flat yeast-leavened bread which is commonly sliced horizontally, toasted, and buttered. Toasted English muffins, which are often used in the United States as a breakfast food, may be served with sweet toppings (e.g., fruit jam, or honey) or savory toppings (e.g., eggs, sausage rounds, bacon, or cheese). English muffins are also used as the bread in a variety of breakfast sandwiches, and are an essential ingredient in Eggs Benedict and most of its variations. In the United States and U.S.-influenced territories, they are called English muffins to distinguish them from U.S. muffins, which are larger and sweeter miniature baked quick breads. 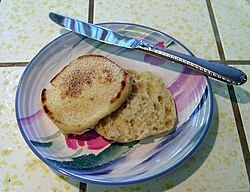 English muffins are very similar to bolo do caco in Portuguese cuisine. The word muffin is thought to be Low German muffen meaning "little cakes". In the past, muffins were sold door to door by hawkers in England as a snack bread before most houses were provided with ovens in the early nineteenth century, giving rise to the traditional English nursery rhyme "The Muffin Man", which dates from 1820 at the latest. Wholemeal English muffins from a Tesco in Abingdon, England. References to English muffins appear in U.S. newspapers starting in 1859, and detailed descriptions of them and recipes were published as early as 1870. Samuel Bath Thomas emigrated from Plymouth, England, to New York City in 1874. By 1880 he had opened his own bakery at 163 Ninth Avenue. Using his mother's recipe, he began making 'English' muffins at his Ninth Avenue bakery in 1880, selling them from the bakery to hotels and grocery stores. They were soft and spongy after baking like traditional muffins, but were also pre-cut, which was later called "fork-split", so as to be able to be pulled apart, giving a rougher toasting surface than would be obtained by slicing. Later they were baked in ovens. 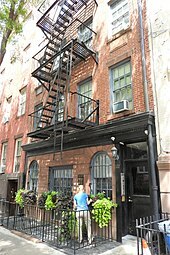 They became popular as an alternative to toast; Thomas opened a second bakery around the corner from the first at 337 West 20th Street in a building that remains known as "The Muffin House". The Merriam-Webster dictionary gives the origin of the term English Muffin as 1902. In a trademark filing in 1926, it was stated that the Thomas' name of the product was first used in 1894. Thomas' is a brand of English muffins and bagels in North America, founded by Samuel Bath Thomas. Today the company is owned by Bimbo Bakeries USA, which also owns the Entenmann's, Boboli, Stroehmann, and Arnold bakeries. Foster's sourdough English muffins were a popular brand English muffin originally from San Francisco. They were a signature menu item at Foster's restaurants from the 1940s to the 1970s, and continued to be produced as a packaged brand until 2008. English muffins can be purchased in a wide range of varieties, including whole wheat, multigrain, cinnamon raisin, cranberry, and apple cinnamon. English muffins are sold in all British supermarkets and many bakeries and are referred to as simply muffins. U.S.-style muffins may be referred to as American muffins, American-style muffins or sweet muffins for clarity or branding purposes, but most people have no problems distinguishing one from the other and use the same word for both. English muffins are also available in most major supermarkets across Germany under the name Toastbrötchen which translates as "toast bun". ^ "The Art of Cookery Made Plain and Easy". Wikipedia. Retrieved 24 January 2019. ^ David, Elizabeth (1977). English Bread and Yeast Cookery. London: Allen Lane. ISBN 0713910267. Contains a discussion on the origins and use of the English muffin. ^ "muffin". Retrieved 29 December 2016 – via The Free Dictionary. ^ "London Sound Survey". Retrieved 11 February 2019. ^ "Thomas' Dining Saloon". The Buffalo Daily Republic. 22 September 1859. p. 2. Retrieved 25 February 2018 – via Newspapers.com. ^ "Wanted: An English Muffin and Crumpet Baker". New York Daily Herald. 17 September 1862. p. 2. Retrieved 25 February 2018 – via Newspapers.com. ^ "Call at Steam Bakery". The Philadelphia Inquirer. 30 May 1863. p. 5. Retrieved 25 February 2018 – via Newspapers.com. ^ "Fancy Bread". The Brooklyn Daily Eagle. 4 November 1870. p. 1. Retrieved 25 February 2018 – via Newspapers.com. ^ "English Muffins". The Weekly Star. 29 March 1876. p. 6. Retrieved 25 February 2018 – via Newspapers.com. ^ "The Food Timeline--history notes: muffins to yogurt". Retrieved 24 January 2019. ^ "Wolferman's: A Different Style Of English Muffin". ^ "Bimbo Bakeries - Our Brands".